Check out these upscale rentals and prepare to be amazed! Our North Myrtle beach luxury properties are loaded with upgrades such as granite counter tops, stainless steel appliances, updated furnishings, and special amenities. Some of these exclusive properties also have private pools, hot tubs, smart TVs, and even arcade games. For an upscale vacation you won’t soon forget, rent one of our luxury properties. Below youll find our wide selection of quality North Myrtle Beach condos, available for weekly summer vacations, off season getaways, and winter monthly rentals. Vacationing in a condo affords an experience similar to a hotel, with enhanced features such as on-site pools and other water amenities, exercise rooms, restaurants, game rooms, and more. 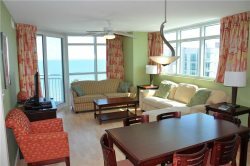 Each of our North Myrtle Beach condos is privately owned and furnished according to its owners discretion. Keep in mind that amenities and ocean views will vary by building, so make sure the condo you choose to rent includes all your desired features. All of our condos are cleaned before your arrival, and equipped with everything you need for your vacation such as cable TV, air conditioning, heat, kitchen appliances, dishes and utensils. For information on additional items to bring, please see our Rental Information page. Use the search bar to the left to narrow your search and only view the properties with your desired attributes. Below you will find our Myrtle Beach private home rentals. Use the “Find My Rental” search to narrow down the results based on your search criteria. Select “Map View” to browse by map location and use the “Sort by” option to filter the results by price, beds, or name.Ocean Drive Beach Rentals also has an impressive selection of condos with resort-style amenities. View our North Myrtle Beach condos, browse North Myrtle Beach Resorts or search all North Myrtle Beach rentals for the largest selection. At any time, feel free to contact us to speak with our friendly and experienced staff. The best part of a North Myrtle beach vacation is, of course, the beach. When you stay in one of our oceanfront North Myrtle Beach rentals for your vacation, you’ll enjoy unlimited sweeping views of the southern Atlantic coast and the unparalleled scent of fresh sea breezes. There’s nothing better than waking up to the sound of the waves outside your window and peering over your balcony at the awe-inspiring sunrise over the water. Stay in one of our beautiful oceanfront condos or private homes and enjoy great amenities and locations, all just steps from the soft sand of our beaches. We understand that a beach vacation just isn’t the same when you have to leave a member of the family behind.With our pet-friendly North Myrtle Beach rentals, you no longer have to worry about making separate arrangements for your dog; just take them along! Our pet-friendly homes have unique features that make them perfect for your furry friends.Check out our selection of pet-friendly properties and book yours today! Each of these properties is well-equipped and furnished to make your stay as comfortable and relaxing as possible. Perhaps a bit less lavish than our Luxury Properties, our Quality Properties serve as excellent vacation rentals and are sure to make a lasting impression on you and your group. Features vary by property, but can include flat screen TVs, WiFi, updated furnishings, community pools, and other fun amenities. Browse for your perfect rental and book today! Standard properties have everything you need for a fun and comfortable stay, all at an affordable price. For those guests that want a memorable beach trip but don’t want to break the bank, our Standard Properties have basic amenities and a bit more “experience” as a rental property. Check out our Standard Properties and secure yours today. Looking for a North Myrtle Beach rental with washer and dryer? Browse our large inventory and book online today!